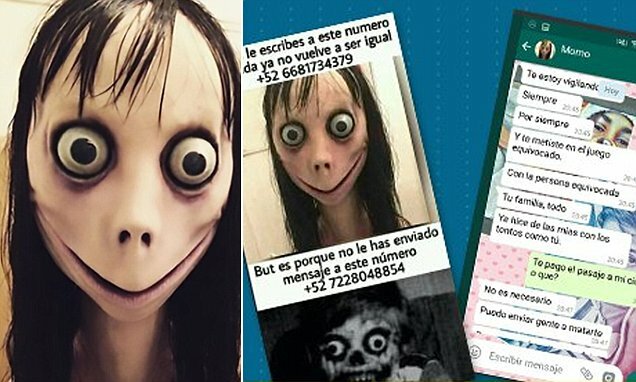 Months after the disturbing game first began popping up in WhatsApp chats around the world, the so-called Momo Challenge has now reportedly made its way into children’s YouTube videos. But, YouTube says it has not ‘received any recent evidence’ of these videos. The challenge is tied to the unsettling image of a woman with grotesque features, ripped off from the work of Japanese doll artist Midori Hayashi, and has sparked concerns that we may be seeing the rise of another ‘Blue Whale’ phenomenon. It appears to follow roughly the same script every time: first, users are challenged to contact ‘Momo’ by sending messages to an unknown number – then, they’re hounded with frightening images and violent messages. Despite the mounting warnings, though, actual examples of the Momo Challenge have remained difficult to nail down. YouTube responded to the reports today after initially staying silent on the topic. ‘Contrary to press reports, we’ve not received any recent evidence of videos showing or promoting the Momo challenge on YouTube,’ a YouTube spokesperson told the DailyDot on Wednesday. Still, authorities and schools have issued warnings to parents across social media to be on the lookout for the references to the disturbing challenge. In a chilling Facebook post this week, a concerned mother shared her six-year-old daughter’s detailed account of how she was targeted by the Momo Challenge while watching a Peppa Pig video on YouTube Kids. Another horrifying story shared by a kids’ hair salon in Gloucestershire claimed the challenge provoked a five-year-old girl to hack off her own hair.